Home away from home! Hola and welcome to Cozumel, enjoy the unreal sunsets and dining from our balcony or while you take a jacuzzi in the private spa on our balcony, this one bedroom, one bath unit on the BEST beach (San Fransisco Beach) and BEST condo complex(Residencias Reef)in Cozumel has everything you can imagine and more to make your vacation a life long memory! A private ,secure and guard gated low rise condo complex (four buildings, three floors in each with approx. 80 units), our unit #8220 is on the second floor, in Building 4. Residencias Reef Condo’s has the best scuba diving accessibility with our shared boat pier that all the dive operators will pick you up from and a large gear rinse tank on property. Snorkeling is also right here on our sandy beach or just relax at one of the two heated pools. The unit is fully equipped, built in 2007. We have gone the extra mile to provide upscale furniture and amenities that include: a 50’ LED smart TV (log into your Nexlix account) with surround sound, DVD, Satellite Dish network TV, DVD videos, full kitchen with stainless steel appliances, granite counters, wood cabinets, Dual Split AC, ceiling fans, spacious bedroom with new king size bed and bedroom set,Sony TV, a sleeper sofa queen bed in the living room, beautiful tile throughout,full bath with granite tops, shower, washer & dryer in unit, FREE US and Canada long distance calling and FREE WI-FI (bring your laptop),a private safe for your belongings. We include beach towels, paper towels, 5 gallon bottled drinking water via a hot & cold dispenser and daily maid service( except Sundays). For a meal without going to town, try the Aura Hotel’s Restaurant right next door, or Carlos N Charlie’s or Ocean on the beach 50 yards to the South. Home cooked meal service is also available in the condo as an extra option. You will be pleased to know that our home is cared for by a locally-based property management staff, to help you when needed and to ensure that your stay with us goes smoothly. Check us out on Facebook(cozumel condo). For a LIVE view of our beach,click on our live Beach Cam link below! Check out our other property in Mammoth Lakes, CA. 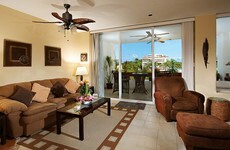 Furnished, Centrally Located, Very Affordable Apartment In Cozumel, Mexico. Romantic Beachfront Just 3 Steps onto the Sandy Beach!